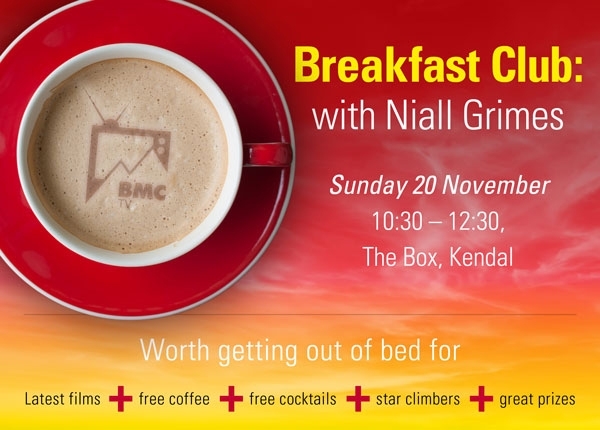 Join us at The Box at 10.30 on Sunday morning (ouch) when Niall Grimes – climber, storyteller and mischiefmaker – will host this unique event for BMC TV. Revive yourself with free coffee and pastries – or a cheeky Bloody Mary if that’s your bag – then sit back for a rocky ride through real British adventure. Features exclusive films, behind-the-scenes footage and plenty of dark humour. Finishes with Hard Rock – our exclusive tribute to Ken Wilson, introduced by filmmaker Paul Diffley. The BMC ambassador team will be there – including James McHaffie, Shauna Coxsey and Steve McClure. Don’t miss out. Last year this was one of the highlights of Kendal. Tickets are already going fast. Hard Rock is a tribute to writer and publisher Ken Wilson (1944-2016). At the heart of the film is an interview recorded with Ken as he was beginning to suffer the effects of dementia. He reflects on his life, his work and the changes he has seen in the climbing world. One of Ken’s most famous books, the classic anthology of climbing essays, Hard Rock, is used as a prism to examine his philosophy. World class climbers Steve McClure, Calum Muskett and Michaela Tracy each pay tribute by climbing a classic route from the book. Ken laments a golden age of adventure and the film marks the passing of the climbing world’s most prolific publisher. Shauna Coxsey’s iron grip has seen her demolish the competition to become IFSC Bouldering World Cup Champion, power up 8b+ outside, join the Redbull Team, become a BMC ambassador and – incredibly – be awarded an MBE for services to crushing. But what happens when the queen of British bouldering is faced with a brutal gritstone crack? We teamed her up with Wide Boy Pete Whittaker to find out. Four artists travel to a remote Scottish bothy to rediscover life off the grid. BMC TV Breakfast Club is £5 to BMC members and £9.50 to non-members. All bookings are via Kendal Mountain Festival site. To get the special £5 BMC members-only price for BMC TV Breakfast Club, email your membership number to hello@thebmc.co.uk and we’ll hook you up. For non-members, it’s £9.50. So, stop hanging about and join today. At only £15.72 for the first year and with hundreds of retail discounts, you’ll soon be saving cash. The Box is a brand-new performing arts facility on Kendal College’s downtown site near Kendal Museum and the railway station. A 15 minute walk from the Brewery Arts Centre, maps available from Box Office. Note: this venue is NOT at the Kendal College Milnthorpe Road site. The easiest way (!) is to exit the Brewery and turn left along Highgate, continue all the way along the High Street to Market Square. Turn right, go through the square and down Branthwaite Brow. Keep left and proceed down Stramongate. Go straight over at crossroads, continue towards river and bridge and the Riverside Hotel. Turn left at Riverside and the Box is on right hand side of the road, set back, a wonderfully weird modern-looking building, built in the shape of a wonky box! What else is on at Kendal? Come on down to Kendal Mountain Festival (18-20 November) for your annual dose of adrenaline packed films, top speakers and overall Kendal magic. Extreme Sport : Why Should We Try Scrambling and Where to Start ?